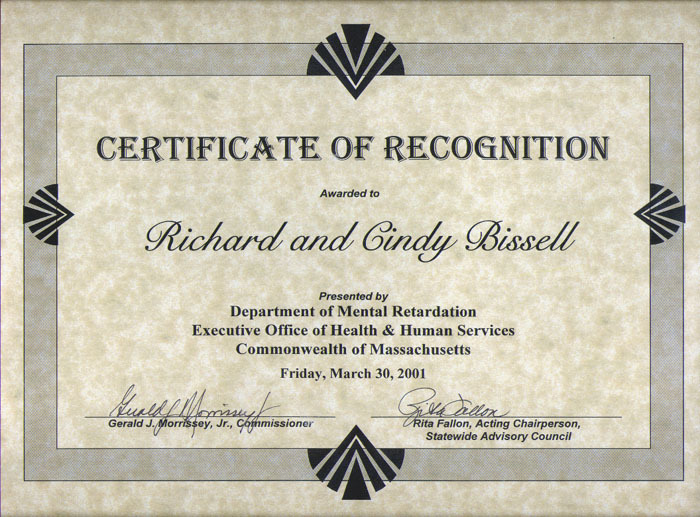 BOSTON: Richard and Cindy Bissell of Grafton received recognition at the 2001 Department of Mental Retardation Statehouse Recognition Ceremony on March 30. The ceremony, entitled “In Partnership with Communities” and hosted by WBZ-TV’s Bob Lobel, honored fifteen individuals and/or groups throughout the state for their progress and accomplish-merits that have been achieved through inter-personal, interagency and collaborative efforts. 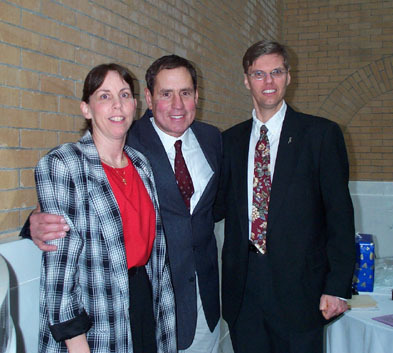 The Bissell’s are parents of twin boys with disabilities who determined a need in the Central Region of Massachusetts for information about disability-related resources. Working in partnership with the Central Region of the Department of Mental Retardation and central region resources, they created and maintain the www.communitygateway.org website. Families, provider agencies, staff, individuals with disabilities and community members are now able to access disability information for local, state, and national resources. The Bissell’s work with large and small groups to provide links to their website and keep online resource information current and accurate. The Mental Retardation community held numerous events throughout the state in March to commemorate the month as Mental Retardation/Developmental Disabilities month. Regional, facilities and area offices working in concert with families and boards hosted a series of local events conferences, legislative receptions and recognition ceremonies to honor the accomplishments of people with developmental disabilities. 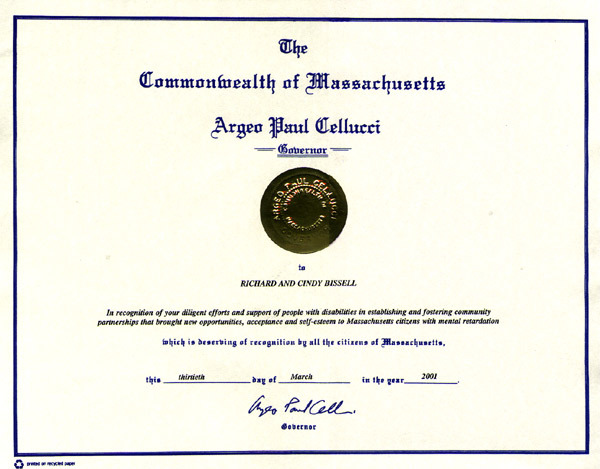 The Commonwealth of Massachusetts Governor Cellucci – Richard and Cindy Bissell In recognition of your diligent efforts and support of people with disabilities in establishing and fostering community partnerships that brought new opportunities, acceptance and self-esteem to Massachusetts citizens with mental retardation. 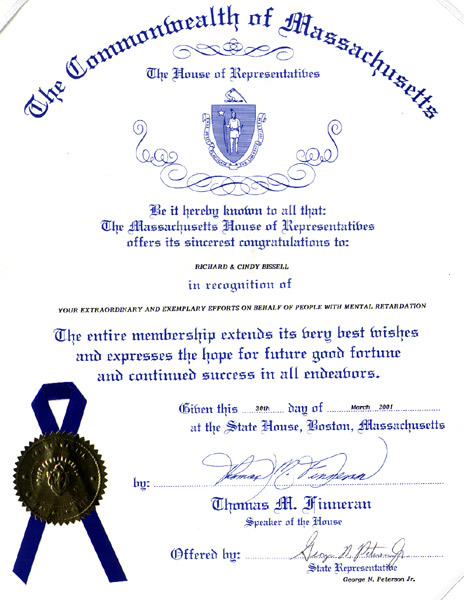 The Massachusetts House of Representatives – Richard & Cindy Bissell in Recognition of your extraordinary and exemplary efforts on behalf of people with mental retardation. 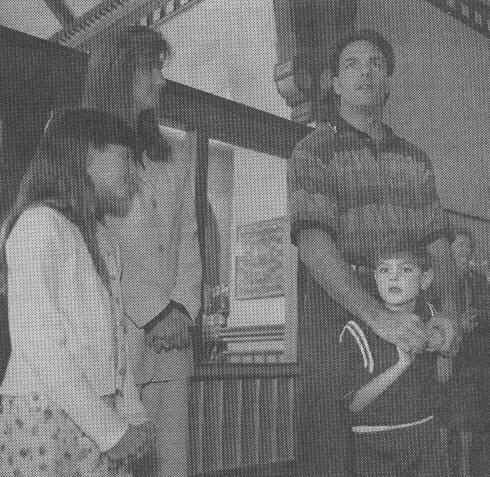 NATICK – Buffalo Bills quarterback Doug Flutie and his son, Dougie, yesterday cut the ribbon at “Dougie’s Corner,” the Morse Institute Library’s new autism resource center in Natick. The new center on the library’s second floor is one of three autism resource centers in the region, and the only one in MetroWest. The center houses more than 200 educational items, including videotapes, information packets, an Internet-linked computer and 120 books new books on autism. The Center, which has been in the works for a year, is the result of a collaborative effort by the library, the Flutie Foundation and The Family Voice. The Family Voice, a support and advocacy group for children with autism and their parents, approached the library about a year ago to house some of it’s research books. Soon after, the group presented the library with a grant. A $10,000 pledge from the Flutie foundation followed. 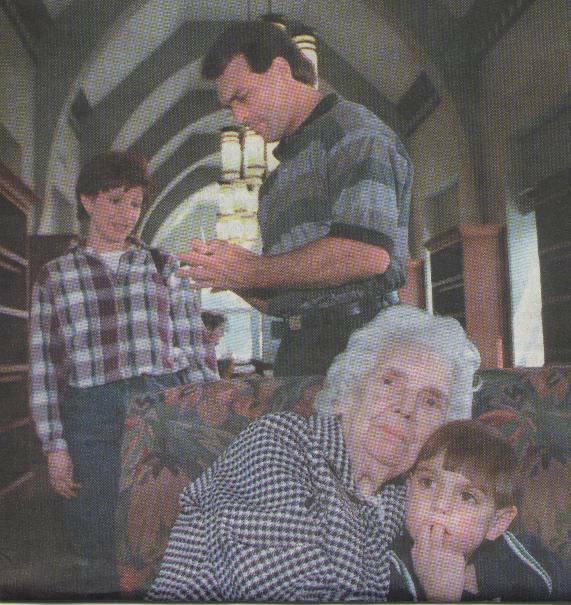 The foundation money will be donated to the center over a period of several years, and the library will use it to update books, videos and other materials and incorporate educational programs about autism for the public. “They just have a lot of good information,” said Chris Campbell, whose son Richie has autism. “Because this is an ongoing thing. We’re constantly learning new things about autism and you really have to keep up to date. The Center’s committee, composed of members of the library, the special education departments of public schools, and the Higachi School for children with autism, will determine which new materials should be included to fuel public awareness. “We were really surprised how much fear we found and that our children weren’t really welcome into society,” said Rich Bissell, a member of Families Organizing for Change, an advocacy group for families with disabled children. His son Eric has cerebral palsy. Eric’s twin brother, Aaron, has developmental disabilities. What Dougie’s Corner is doing it “letting people know that children with disabilities are people first, are children first,” Bissell continues. Clara Claiborne Park, the Autism Awareness Day’s keynote speaker and author of “The Siege,” defined autism through her experience of raising her now 40-year-old daughter, Jesse. Today, Jesse is an accomplished artist whose brilliantly colored paintings of architecture incorporate the autistic person’s demand for precise detail. One sold for $1,000, and her mother is hoping for a New Year City art show. She also works 27 hours per week in a college post office. 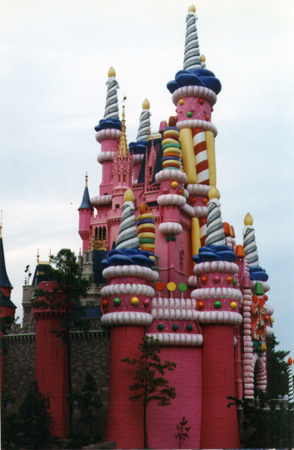 Park was quick to remind the audience that all this did not come overnight. The siege was long. Educating a child with autism is a lifelong building block process. When Park started there were no resource. There was no special education. There was no autism resource center. When you child is diagnosed with a disability, “You have to give up a lot of dreams,” said Bissell, who once dreamed of having the first set of twins in the NFL. “And then create new ones,” his wife, Cindy, chimed in. 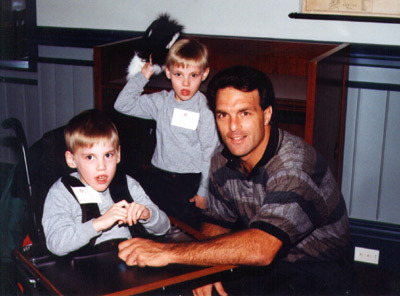 Eric and Aaron Meet Doug Flutie! Trading old dreams for new ones. New Dad Richard Bissell holds his double blessing, sons Aaron and Eric in the Neonatal Intensive Care Unit. I had just taken a bite of my turkey sandwich when my wife, Cindy, came in the front door. I could tell she was fighting back tears. “It’s Eric,” she blurted out and broke down. We had premature twin babies in the Neonatal Intensive Care Unit (NICU). Born after only 26 weeks, they weighed a mere two pounds each. They had been in the hospital for close to six weeks, fighting for their lives. I waited for Cindy to calm down enough to tell me what was happening. I needed to know, but at the same time I was afraid to hear. My mind reeled as she gave me an explanation I couldn’t really comprehend. I felt as if the breath had been knocked out of me. There was a tightness in my stomach and chest. The official diagnosis was periventricular leukomalasia with intracranial hemorrhages. I felt trapped by the words-fancy words for the type of brain damage that leads to cerebral palsy. It was all so hard to believe. We had been splitting shifts at the NICU. Cindy stayed during the day; I did the night shift. We are both nurses at the same health care facility. Our employer had been very understanding, working out our schedules to give us as much time as possible with our babies. Robotically, I made my way to the NICU. It was 11:00 PM. The hospital was quiet and the lights were dim. Glancing at the babies in the “Growing Preemie” section, I wondered if my sons would ever graduate to this haven where stable infants wait to go home. The NICU was busy, as usual. Doctors and nurses walked briskly between incubators, checking IVs and respirators, turning off alarms and discussing treatments with one another in hushed voices. I greeted some familiar nurses and walked into the room our boys shared with 10 other incubators. All the fragile infants were enclosed in their plastic “houses” with each baby’s name on the side. Our boys had a multitude of problems, mostly related to prematurity. Very susceptible to infection, their bodies could not regulate their own temperatures. They could not be handled much because of raw, immature nervous systems. Some days all we could do was reach in through holes in the incubator sides and lightly touch their heads. On good days, we could hold them very gently for five or 10 minutes-very difficult conditions for normal parent/child bonding. I sat down next to Eric’s incubator and peeked in. A tiny bundle, he was sleeping peacefully, breathing on his own now with a nasal cannula taped to his nose for extra oxygen. He was hooked up to monitors to alert the nurses if he stopped breathing or if his heart rate dropped, both of which happened many times a day. The nurses would rush over and calmly shake him, a little “reminder to breathe.” It had taken us a while to accept this routine. I stuck my hand through the porthole of Eric’s incubator and lightly touched his head. He stirred slightly, then went back to sleep. As I sat there, I thought of the necrosis (tissue death) and bleeding in his tiny brain. I walked over to Aaron’s incubator, located right next to Eric’s. Still on a respirator, he was too weak and fragile to breathe on his own. Looking at my sons, I had many mixed emotions: anger that they were not healthy and strong; fear and sadness because they were so sick, fragile and vulnerable. Mostly, however, I felt an intense love and desire to protect them from harm. It was so difficult to stand by as they were bombarded by constant prodding and probing required for a multitude of medical procedures. Their tiny heels were black and blue from multiple blood tests. IVs were repeatedly stuck in their little arms. Even eating was an unpleasant task: Tubes stuck down their throats allowed Cindy’s breast milk to be poured into their stomachs. We seemed to get into a pattern of good and bad days. Usually every few days brought a crisis with one baby or the other. Two steps forward, one step back; sometimes the other way around. It was then that we realized how strong Aaron is. He has a tremendous will to survive. After the surgery, seeing him with a tracheostomy was upsetting, but, at the same time, we were relieved that he looked so comfortable. He was at ease for the first time in weeks, neither having a tube down his throat nor having to struggle to breathe. With both boys so unstable, however was difficult to see any light at the end of this long tunnel. 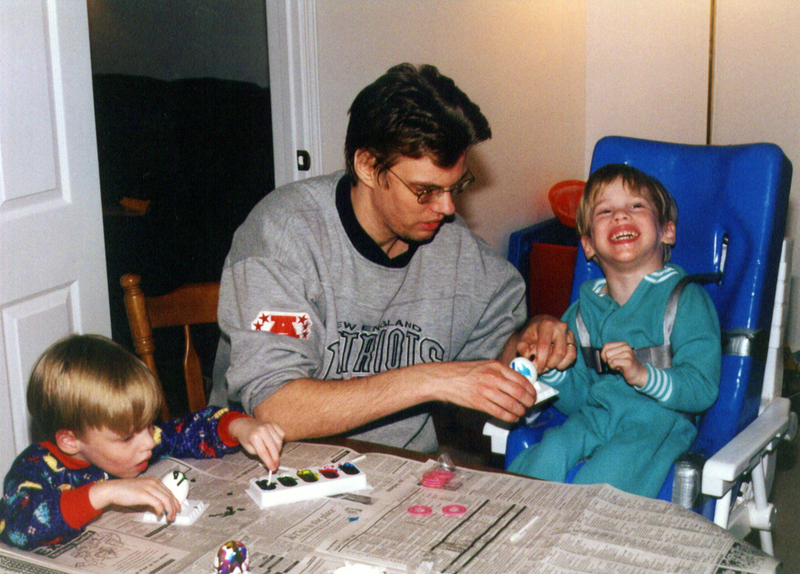 Eric and Aaron, now four years old, are busily at work dyeing Easter eggs with their dad, Richard. The boys at four now weigh in at around 30 pounds each. Aaron breathes through a tracheostomy tube and has some residual respiratory problems, but in all other ways he is like any other toddler, exploring and examining every new object as if it is some scientific breakthrough. Unable to vocalize, he makes all kinds of interesting creative noises and grins at his own cleverness. Eric is certainly his own little person. Because of spastic quadriplegia cerebral palsy, he receives intensive therapy four times a week. He is unable to sit up or crawl, and even has trouble rolling over. His smile comes easily, however, and he is a happy boy. I can see the intelligence in his eyes. The twins have strengthened us and they have taught us what is really important in life. When we had learned that Cindy was pregnant with twin boys, I had had dreams of big strapping football players: the first twins in the NFL! We would do so much together-run, bike, watch the games on Sundays. All these dreams disappeared when I had to face what I saw then as a grim truth. Although things have calmed down a bit, we still have good days and bad days. More challenges lie ahead. But I wouldn’t trade our boys for Super Bowl Twins! As I wrestle and play on the floor with them, many of the bad memories fade. Richard Bissell and his wife Cindy are nurses and work together at the Newton and Wellesley Alzheimer Center. 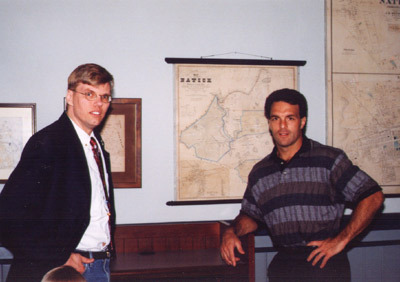 They live with their twin sons, Eric and Aaron, in Grafton, Massachusetts. Aaron and Eric Bissell are identical twins whose very different disabilities stem from medical complications associated with their premature birth. Aaron (left) has bronchopulmonary dysplasia and a tracheostomy; he is now oxygen-dependent only while sleeping. 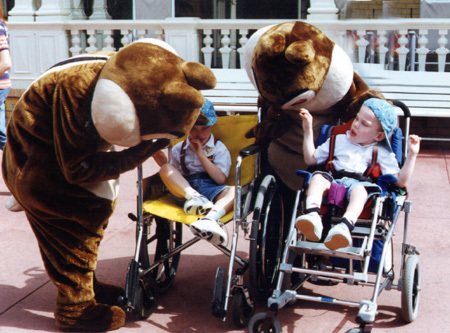 Eric (right) has spastic quadriplegia cerebral palsy. Seventeen weeks into my pregnancy, an ultrasound revealed that our first “child” would be twins! Our excitement and anticipation were short-lived, however. 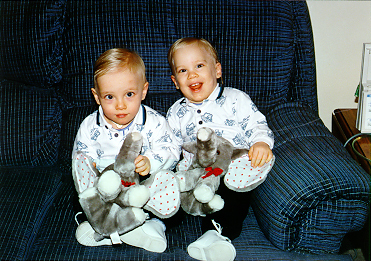 Eric and Aaron were born a 26 weeks gestation–three and a half months too soon. Our lives as parents certainly got off to a rough start, as did the lives of our boys, who were immediately whisked off to the neonatal intensive care unit (NICU). When we finally got to visit, it was difficult to see our babies among all the tubes and wires. They looked like little albino monkeys, covered with fine blond hair. The boys spent the next three months in the NICU, a stressful roller coaster ride that can be truly understood only by other parents of “preemies.” Both boys had many of the problems common to prematurity, including hypotension (abnormally low blood pressure), respiratory distress syndrome, intracranial hemorrhages (bleeding in or around the brain), retinopathy of prematurity (an eye disorder), patent ductus arteriosus (a condition in which oxygenated blood flows back into the lungs rather than circulation to the rest of the body), hyperbilirubinemia (jaundice) and anemia. 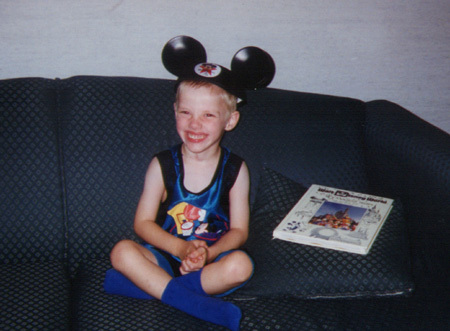 Eric’s most serious problem was bilateral periventricular leukomalasia (PVL), a condition in which tissue around the brain’s ventricles (cambers in which cerebrospinal fluid is made and circulated) is damaged due to insufficient blood flow or lack of oxygen. Aaron needed a tracheostomy because of acquired subglottic stenosis (a narrowing of the area beneath the vocal cords and the opening between them), an unfortunate result of his earlier need for a breathing tube. Because of damage to his lungs and airways, he also had bronchopulmonary dysplasia, a chronic condition that would always affect his breathing. The twins’ first year was pretty much a blur. 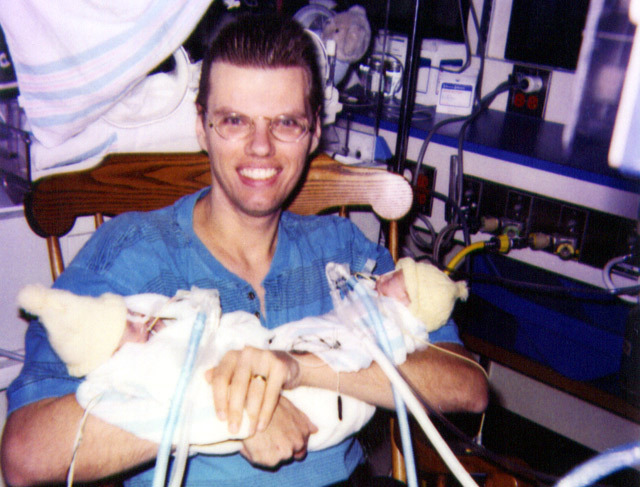 Aaron, who was oxygen-dependent, needed 24-hour-a-day nursing care; Eric was a colicky, fussy baby who rarely slept. We knew Eric had PVL and would probably have a disability but had no idea how mild or severe it might be. Not knowing was the hardest thing to deal with; once he was actually diagnosed with spastic quadriplegia cerebral palsy, we could finally begin to cope. Although Aaron’s problems are more acute now, his long-term prognosis is good; Aaron’s problems can be “fixed.” We no longer notice his tracheostomy; even to Aaron, it’s just a part of who he is–eyes, ears, nose, bellybutton, trach. At the same time, Aaron’s more average motor skills are a constant reminder of what Eric might have been. They would be so cute running around the house together. Despite their differences, the boys share a close bond. It is common for twins to develop their own private “language,” but because of Aaron’s tracheostomy and Eric’s severe speech delays, our twins communicate through an unusual “quacking” noise. Sometimes it sounds like we have ducks in the living room. Richard and I are often asked how we manage. Well, “problems” are all a matter of perspective. I discovered this back in the NICU when we were told that Eric had PVL and Aaron would need a tracheostomy. I was paralyzed with worry and fear but gained some insight on my own situation by observing two other mothers. One woman was upset because one of her twins was temporarily under an oxygen hood; the other was despondent because one of her twins had died. All three of us were grieving from different perspectives. I realized that although things could be better, they could also be much worse.